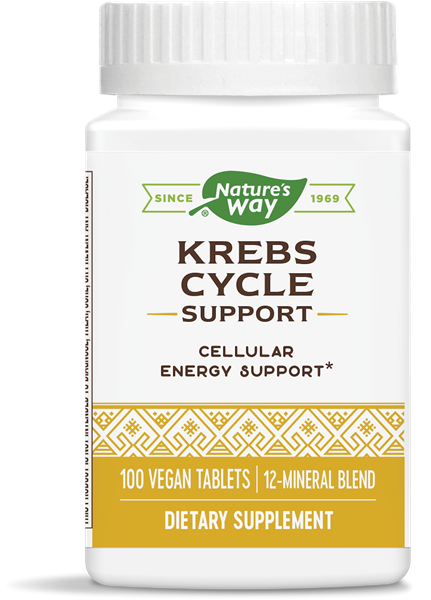 Krebs Cycle Chelates / 100 tabs - Nature's Way®. Why are Krebs cycle minerals important? Why use Krebs Cycle Chelates? Krebs Cycle Chelates are a combination of major and trace minerals bound, or chelated, to Krebs cycle intermediates. The Krebs cycle is the common pathway for converting carbohydrates, fats, and proteins into chemical energy. Take 4 tablets daily. If pregnant, nursing, or taking any medications, consult a healthcare professional before use. Accidental overdose of iron-containing products is a leading cause of fatal poisoning in children under 6. Keep this product out of reach of children. In case of accidental overdose, call your physician or a Poison Control Center immediately. Multivitamin with essential nutrients for women.